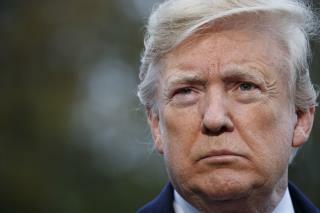 (Newser) – George Conway, husband of White House counselor Kellyanne Conway, has been a force for pushback on President Trump—including defending the Robert Mueller probe, trolling Trump on Twitter, and co-writing a recent op-ed against Trump's proposal to end birthright citizenship—and Trump has mainly steered clear from commenting on the unusual situation. That changed this week, however, after Conway penned another op-ed with attorney Neal Katyal, this one appearing in the New York Times and blasting Trump's appointment of new Acting Attorney General Matthew Whitaker as "unconstitutional." Reporters asked Trump Friday what he thought of George Conway's latest piece, and Trump didn't hold back this time. Jesus christ, Trump is so TRANSPARENT. He throws petulant and unbelievably rude tantrums when asked simple questions. He is drowning and he should just leave. He was never qualified for this job. Like Trump this Whitaker guy is kinda shady. Birds of a feather. What the hell is going on now with that thing on his head?